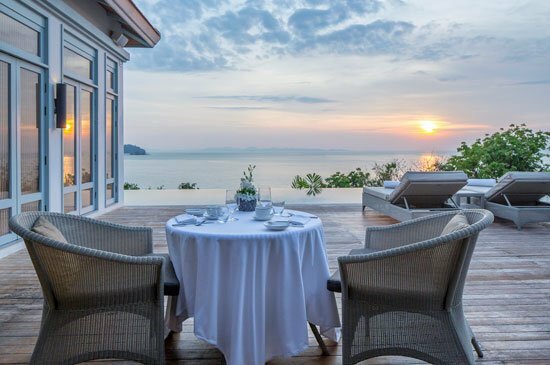 PHUKET, THAILAND – Amatara Resort & Wellness, one of Thailand’s most comprehensively equipped resort wellness and spa experiences, introduces The Retreat, a restaurant outlet dedicated to serving healthy and nutritious food and beverages. Previously known as The Club, the newly refreshed venue The Retreat better harmonises the resort’s F&B offering with its high quality spa and luxury wellness programs and facilities. The Amatara wellness cuisine concept is deeply rooted in ancient traditions, making it a peaceful sanctuary to embrace authentic healing and living foods. The menu is based on local Thai cultural inspiration, which encourages the nurturing of harmony with spirit, the environment and to re-connect with one another. Amatara’s mind, body and spirit approach to wellness and wholefood supports an organic healing process to naturally heal and improve the body and state of wellbeing; a key part of this is of course superb nutrition. Amatara’s Wellness Director, Phoebe Boonkerd, explains, “Through the guest’s experience of our simple, balanced, creative and delicious wholefood cuisine, it is our hope that the guest returns home feeling nourished and rejuvenated, and inspired to continue the journey of good health through optimal nutrition. The menu is designed by our head chef and our nutritionists; it offers a delicious and healthy composition of the highest quality local and imported ingredients, organic fruits, vegetables and free-range meat and poultry. The Retreat will be serving a variety of healthy options including raw juice blends, superfood smoothie blends, salads, appetisers, soups, broth, main course, desserts, herbal tea and healthy coffee. These are delicately crafted in-house based on foundations of using real, unrefined whole foods, free range, cold–pressed oil and avoiding additives, pesticides, toxins, refined sugars and extremes of temperature. The menu features seasonal, innovative cuisine with a diverse array of traditional and modern healthy eating influences. For example, the delicious-yet-healthy menus feature Soft Cured Ocean Trout with Organic Leaf Salad, Poached Prawns & Quinoa Salad with Ginger and Ginseng Dressing, Goji & Mussel Chowder Soup, Stir Fried Beef Tenderloin with Ginger and Yuzu Soy Sauce, Young Coconut Pudding and many more. For operating hours at The Retreat, breakfast is served from 06:30 – 10:30 a.m.; however, this is exclusive for Wellness Retreat and Pool Villa guests only. The Retreat will open to all guests for lunch during 11:30am – 2:00pm and for dinner from 5:00 – 8:00pm. Half Board & Full Board guests are welcomed to dine at The Retreat for their meals following operating hours. For more information about Amatara Resort & Wellness, please call +66 (0) 76 200 800, +66 (0) 76 318 888, Fax +66 7620 0803, or visit www.amataraphuket.com or email sales.phuket@amataraphuket.com.